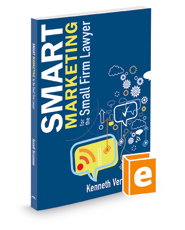 Published by the American Bar Association (ABA), Smart Marketing for the Small Firm Lawyer thoroughly explores today's marketing landscape and outlines its many facets for you in concise and easy to understand terms. Included with this book is a helpful CD-ROM with digital copies of all the exhibits used in the book and the various websites that are referenced. Learn how to make the most the marketing opportunities that exist with Smart Marketing for the Small Firm Lawyer.